This is an NCLEX review for chronic bronchitis vs emphysema. Patients who have chronic bronchitis and emphysema struggle with shortness of breath and proper gas exchange. However, these two conditions differ in many ways, especially the pathophysiology. In the previous review, I covered other respiratory disorders. So, if you are studying for NCLEX or your nursing lecture exams be sure to check out that section. When taking care of a patient with chronic bronchitis and emphysema, it is very important the nurse knows how to recognize the typical signs and symptoms seen in these conditions, how it is diagnosed, nursing interventions, and patient education. Don’t forget to take the chronic bronchitis vs emphysema quiz. How these two conditions are the same? What is happening in chronic bronchitis? The inflamed and deformed bronchioles produce EXCESSIVE MUCOUS due to hyperplasia of the goblet cells. The cilla are damaged so they can’t move mucus out of the airway and this limits the patient’s ability to have proper gas exchange and breathe with ease. Main issue is with INFLAMMATION OF BRONCHIOLES due to the damage from inhalation of some type of irritant. This leads to cyanosis “blue” color and increased lung volume “bloating” and edema (late effects on the heart for the development of cor pulmonale). Patients with chronic bronchitis are also known as “blue bloaters”. The capillary bed (where gas exchange takes place) is NOT damaged so this affects how the body will compensate. The bronchioles are surrounded by alveolar tissue which start to degenerate (lose form and disappear). When this happens the bronchiole lose support and become don’t open properly to allow air to flow into the sacs for gas exchange. Mainly, the problem is with exhalation…because during inspiration the airways expand due to negative pressure. HOWEVER, on exhalation (because the lungs are full of air) the positive pressure prevents the airways from staying open. So, exhaled air does not all the way leave the lungs….hence the patient doesn’t have the ability to fully exhale. They experience hyperinflation of the lungs overtime. There is also decreased oxygen and high carbon dioxide in the blood (respiratory acidosis). Remember the capillary bed works (so perfusion is good) BUT ventilation is very poor. So, there is a V/Q MISMATCH. Hence, ventilation (V) doesn’t match perfusion (Q). So, the body tries to compensate by increasing red blood cell production and shifting blood which puts a lot of pressure on the pulmonary artery. This causes complications and leads to pulmonary hypertension and eventually right-sided heart failure “cor pulmonale”. What is happening in emphysema? Main issue is with damage to the alveolar sac (loses elasticity…becomes floppy and doesn’t inflate and deflate properly) leading to “air-trapping”. This condition also leads to hyperventilation (puffing to breathe…compensatory mechanism) and pink complexion (they maintain a relatively normal oxygen level due to rapid breathing) rather than cyanosis as in chronic bronchitis. Patients with emphysema are sometimes called “pink puffers”. In emphysema, the alveoli sacs lose their ability to inflate and deflate due to an inflammatory response in the body. Due to the damage to the alveoli sac, there is damage to the capillary bed so there will a matched V/Q defect (ventilation and perfusion both poor…hence they match). So, areas of low ventilation (V) have poor perfusion (Q). Because the sac cannot deflate or inflate, inhaled air starts to get trapped in the sacs and this causes major hyperinflation of the lungs because the patient is retaining so much volume. Hyperinflation causes the diaphragm to flatten. The diaphragm plays a huge role in helping the patient breathe effortlessly in and out. Therefore, in order to fully exhale, the patient starts to hyperventilate and use accessory muscles to get the air out now. This leads to the barrel chest look and during inspection it may be noted there is an INCREASED ANTEROPOSTERIOR DIAMETER. The damage in the sacs cause the body to keep high carbon dioxide levels and low blood oxygen levels (respiratory acidosis). Inhaled oxygen will not be able to enter into the sacs for gas exchange and carbon dioxide won’t leave the cells to be exhaled. 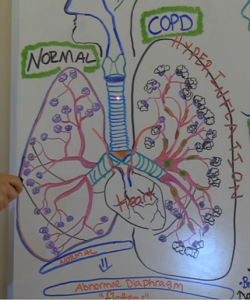 The body tries to compensate by causing hyperventilation (increasing the respiratory rate…hence puffing) and the patient will have less hypoxemia “pink complexion” than chronic bronchitis (who have the cyanosis) because pink puffers keep their oxygen level just where it needs to be from hyperventilation.